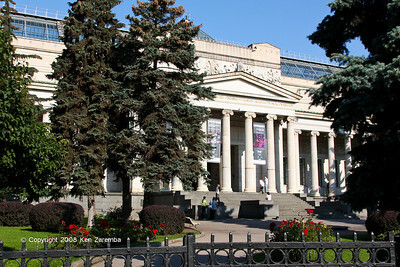 The Pushkin Museum of Fine Arts is the largest museum of European art in Moscow, located in Volkhonka street, just opposite the Cathedral of Christ the Saviour. The museum's name is a misnomer, as it has nothing to do with the famous Russian poet. The Cathedral of Christ the Saviour is a cathedral in Moscow, Russia, on the northern bank of the Moskva River, a few blocks south-west of the Kremlin. 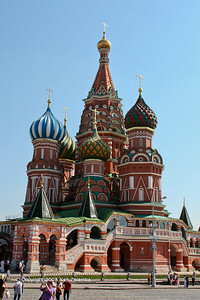 With an overall height of 105 metres (344 ft), it is the tallest Orthodox Christian church in the world. The cathedral is not owned by the church, which rents out space on the premises. Under the state atheism espoused by the USSR, many "church institution[s] at the local, diocesan or national level were systematically destroyed" in the 1921-1928 antireligious campaign. As a result, after the Revolution and, more specifically, the death of Vladimir Lenin, the prominent site of the cathedral was chosen by the Soviet leader Joseph Stalin as the site for a monument to socialism known as the Palace of the Soviets. It took more than a year to clear the debris from the site. Some of the marble from the walls and marble benches from the cathedral were used in nearby Moscow Metro stations. The original marble high reliefs were preserved and are now on display at the Donskoy Monastery. 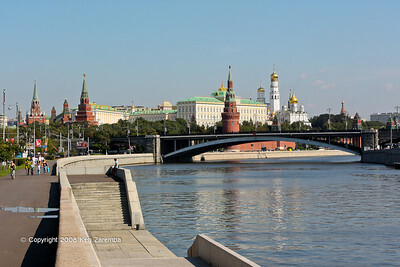 The construction of the Palace of Soviets was interrupted owing to a lack of funds, problems with flooding from the nearby Moskva River, and the outbreak of war. The flooded foundation hole remained on the site until, under Nikita Khrushchev, it was transformed into the world's largest open air swimming pool, named Moskva Pool. In February 1990, the Russian Orthodox Church received permission from the Soviet Government to rebuild the Cathedral of Christ the Saviour. A temporary cornerstone was laid by the end of the year. A construction fund was initiated in 1992 and funds began to pour in from ordinary citizens in the autumn of 1994. In this year the pool was demolished and the cathedral reconstruction commenced. 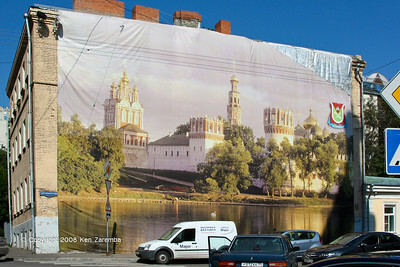 About one million Muscovites donated money for the project. 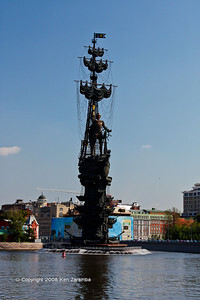 The Peter the Great Statue in Moscow was designed by the Georgian designer Zurab Tsereteli to commemorate 300 years of the Russian Navy, which was started by Peter I of Russia. It is the eighth tallest statue in the world. 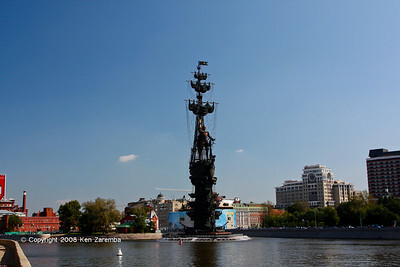 The 98-meter-high monument to Peter the Great designed by Zurab Tsereteli was erected at the confluence of the Moskva River and the Obvodnoy Channel in 1997. In November 2008, it was voted the tenth ugliest building in the world by Virtual Tourist. In 2010, it was included in a list of the world's ugliest statues by Foreign Policy magazine. "Questions of taste aside, Muscovites were sceptical about the whole idea: why pay tribute to Peter the Great, who loathed Moscow and moved the capital to St Petersburg?" 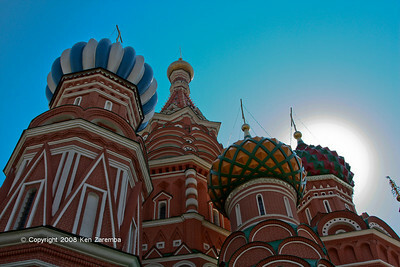 Saint Basil's Cathedral. 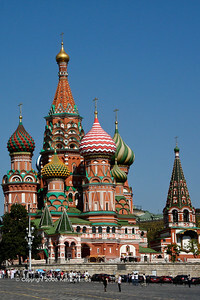 The Cathedral of the Protection of Most Holy Theotokos on the Moat or Pokrovsky Cathedral are official names for a Russian Orthodox church in Red Square in Moscow. 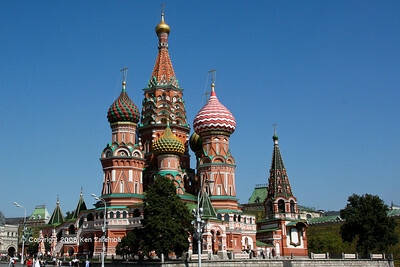 The church is also called the Cathedral of St. Vasily the Blessed, anglicized as Saint Basil's Cathedral. 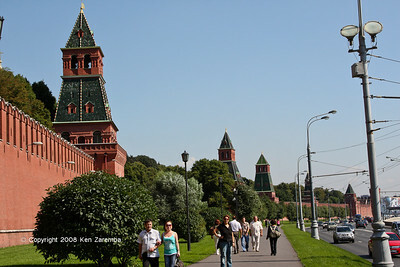 It was built from 1555–61 on orders from Ivan the Terrible and commemorates the capture of Kazan and Astrakhan. St. Basil's marks the geometric center of Moscow. 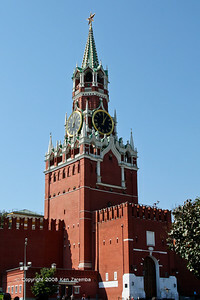 It has been the hub of the city's growth since the 14th century and was the city's tallest building until the completion of the Ivan the Great Bell Tower in 1600. The building is shaped as a flame of a bonfire rising into the sky, a design that has no analogues in Russian architecture. 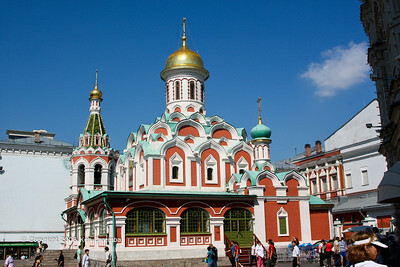 As part of the program of state atheism, the church was confiscated from the Russian Orthodox community as part of the Soviet Union's anti-theist campaigns and has operated as a division of the State Historical Museum since 1928. It was completely and forcefully secularized in 1929 and, as of 2013, remains a federal property of the Russian Federation. 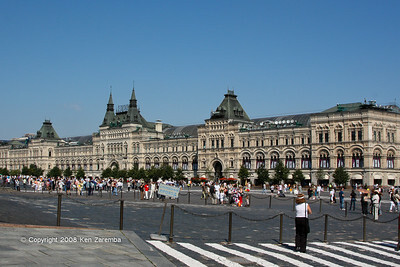 Red Square's Victorian GUM (Gosudarstvenny Universalny Magazin) Mall opened in 1893 with more than 1,000 shops. 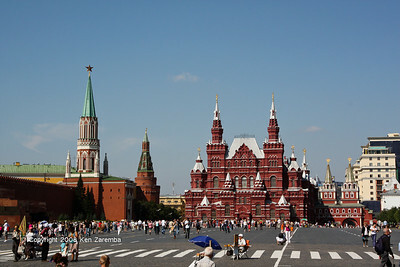 It is the largest in Russia. Today it is an outlet for luxury goods. 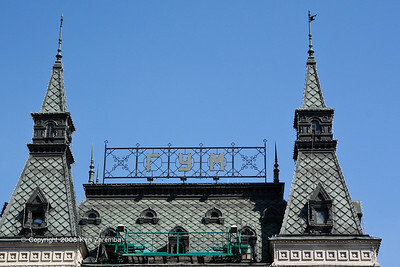 The GUM Department Store, State Historical Museum of Russia and Resurrection Gate in bachground. The State Historical Museum (Gosudarstvenny istoricheskiy muzyey) of Russia is a museum of Russian history wedged between Red Square and Manege Square in Moscow. Its exhibitions range from relics of prehistoric tribes that lived on the territory of present-day Russia, through priceless artworks acquired by members of the Romanov dynasty. The total number of objects in the museum's collection comes to millions. Kazan Cathedral, also known as the "Cathedral of Our Lady of Kazan", is a Russian Orthodox church located on the northeast corner of Red Square in Moscow, Russia. The current building is a reconstruction of the original church, which was destroyed at the direction of then General Secretary of the Central Committee of the Communist Party of the Soviet Union, Joseph Stalin, in 1936. In 1936, when Red Square was being prepared for holding the military parades of the Soviet Union, Joseph Stalin ordered the square cleared of churches. Although efforts were made by Baranovsky to save it, he could not prevent the Kazan Cathedral from being demolished. 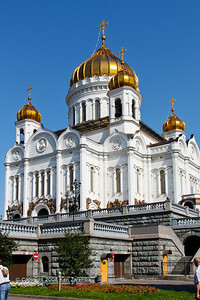 After the fall of the Soviet Union, the Kazan Cathedral was the first church to be completely rebuilt after having been destroyed by the Communists. 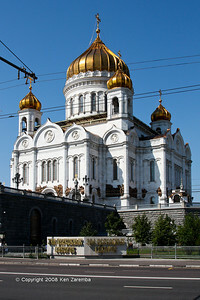 The cathedral's restoration (1990–1993) was sponsored by the Moscow city branch of the All-Russian Society for Historic Preservation and Cultural Organization, and was based on the detailed measurements and photographs of the original church. 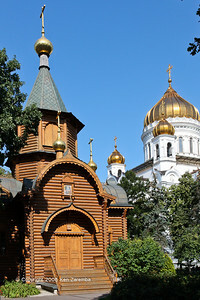 However, the icon of the Kazan Virgin in the restored cathedral is a copy; the original is now in the Yelokhovo Cathedral. 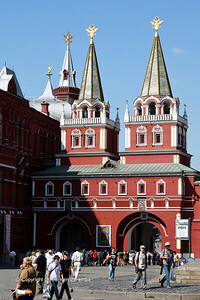 Resurrection Gate , also called Iberian Gate is the only existing gate of the Kitai-gorod in Moscow. 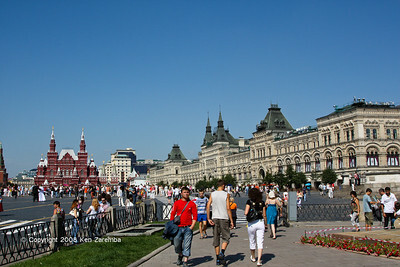 It connects the north-western end of Red Square with Manege Square and gives its name to nearby Voskresenskaya Square (Resurrection Square). 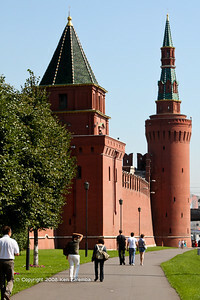 The gate adjoins the ornate building of the Moscow City Hall to the east and the State Historical Museum to the west. Just in front of the chapel is a bronze plaque marking kilometre zero of the Russian highway system. The first stone gate leading to Red Square was erected in 1535, when the Kitai-gorod wall was being reconstructed in brick. When the structure was rebuilt in 1680, the double passage was surmounted with two-storey chambers crowned by two octagonal hipped roofs similar to the Kremlin towers. An Icon of the Resurrection was placed on the gate facing towards Red Square, from which the gate derives its name. In 1931, the Resurrection Gate and the chapel were demolished in order to make room for heavy military vehicles driving through Red Square during military parades. Both structures were completely rebuilt in 1994-1996, and a new icon of the Iveron Theotokos was painted on Mount Athos to replace the original.